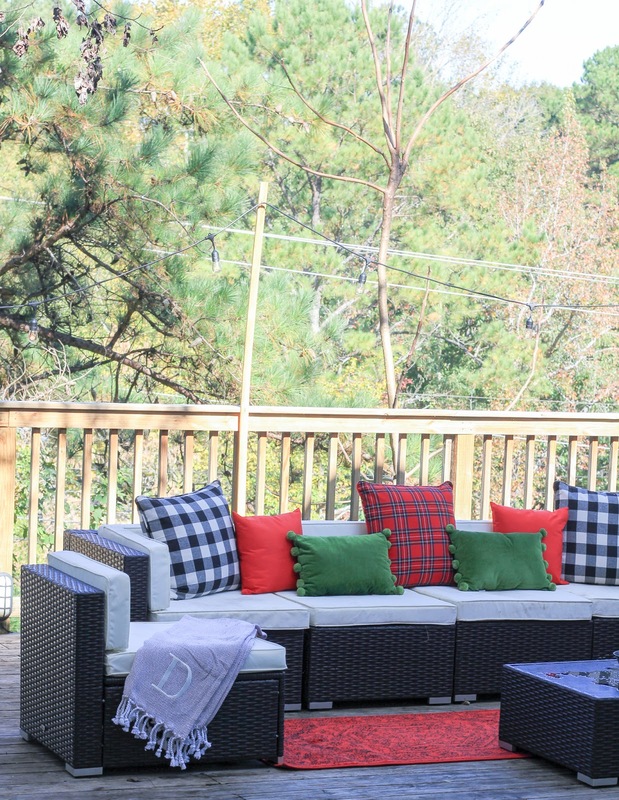 One thing that I never even thought about wanting when it came to rental house hunting was an outdoor space. The only thing I thought about when it came to an outdoor space was hoping that I wouldn’t have to mow it or do yard work. 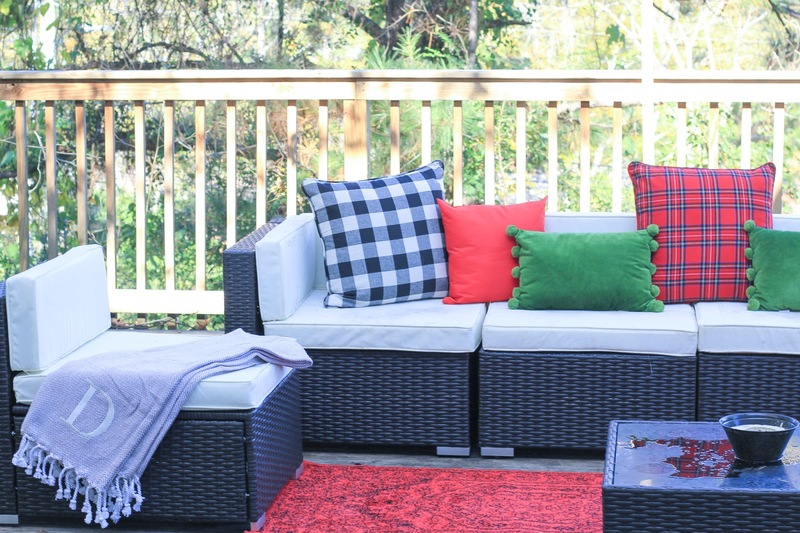 Lucky for us, a yard service was included in our rent so that and the great back deck we have became a quick selling factor for us. 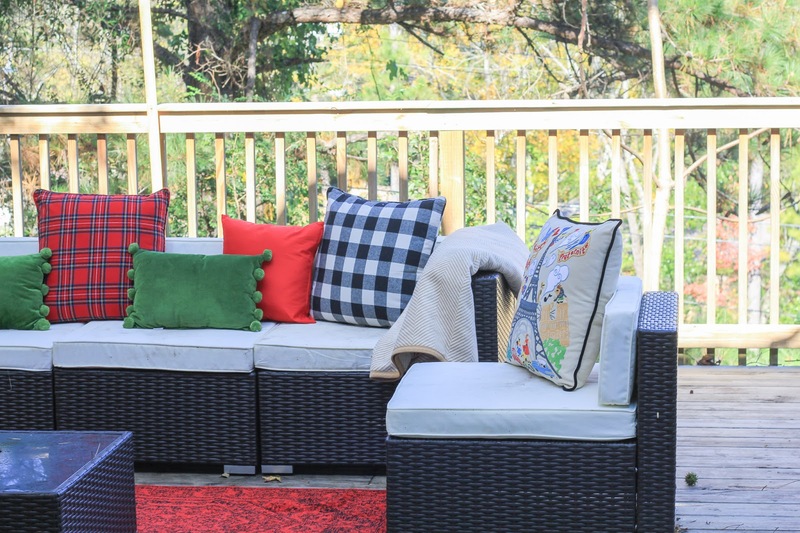 While an outdoor space isn’t something that most people would probably prioritize when furnishing their space, we knew we wanted to be able to use it before it was too cold to do so. This meant finding furniture (and building it which was a hassle), hanging up lights, and even figuring out how to set up a projector to watch football games. Needless to say, the space has been transformed and well used thus far. 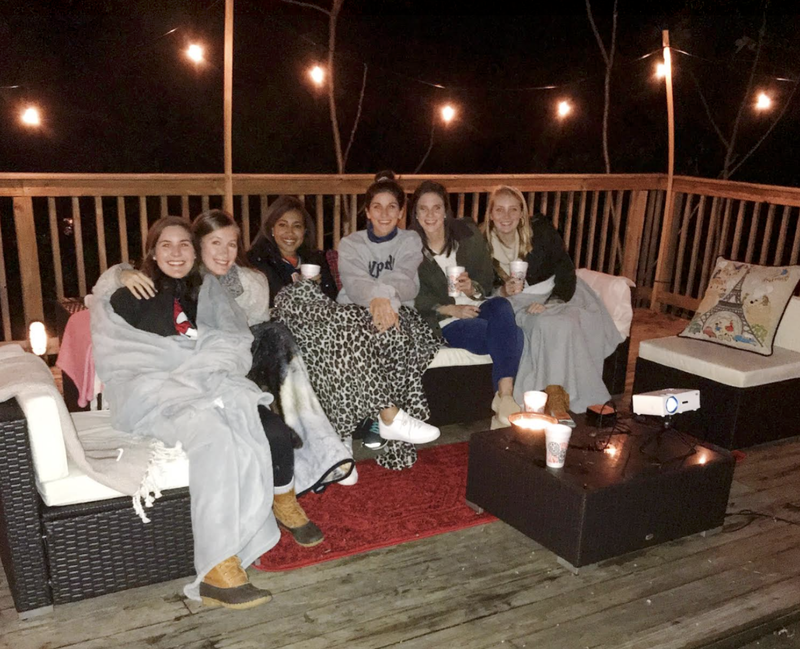 Now that is starting to cool down we aren’t fully ready to move the party inside and decided to add a few new touches to our deck to make it cozier and better fit for the weather. Now that it is fully decked out (hopefully at least one of you laughed at that pun) I figured it was time to finally share it with you. It doesn’t hurt that the leaves are changing making it especially picture-esque right now. 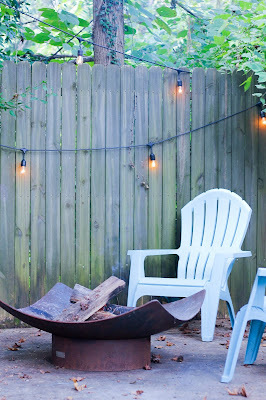 Starting on the far-right side of the “backyard” space is our fire pit. 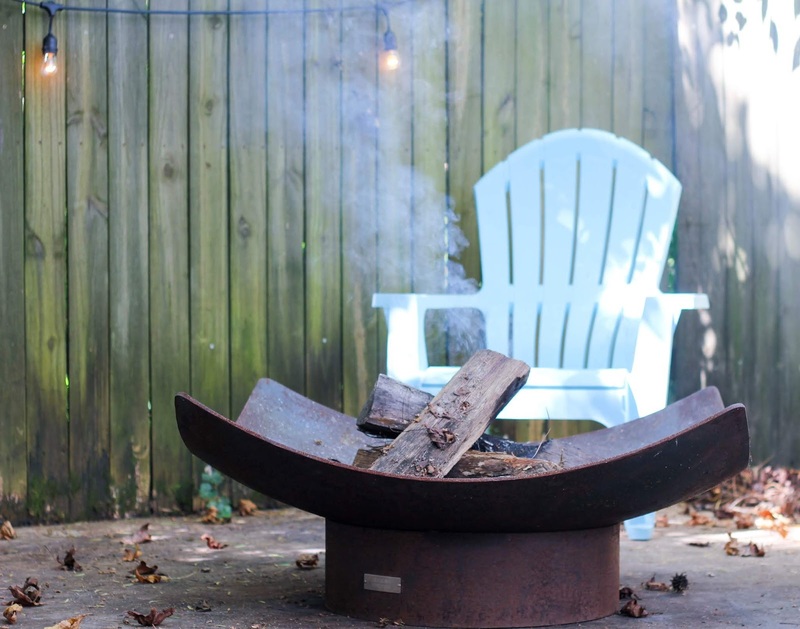 If you didn’t see my post (here) with Seasons Fire Pits. Being the smart renters we are, we knew this needed to have a prominent place outside but also needed to sit on something other than the wooden deck. Fortunately, this area of concrete became the perfect place for our fire pit and a few chairs to gather around it. The lights we hung had enough excess that we were able to drape them a bit more in this area which makes it even more inviting. A plastic table under the overhang has proved to be the perfect place to put s’mores supplies and different drinks so that we don’t have to go in and out as much when we are entertaining outside. 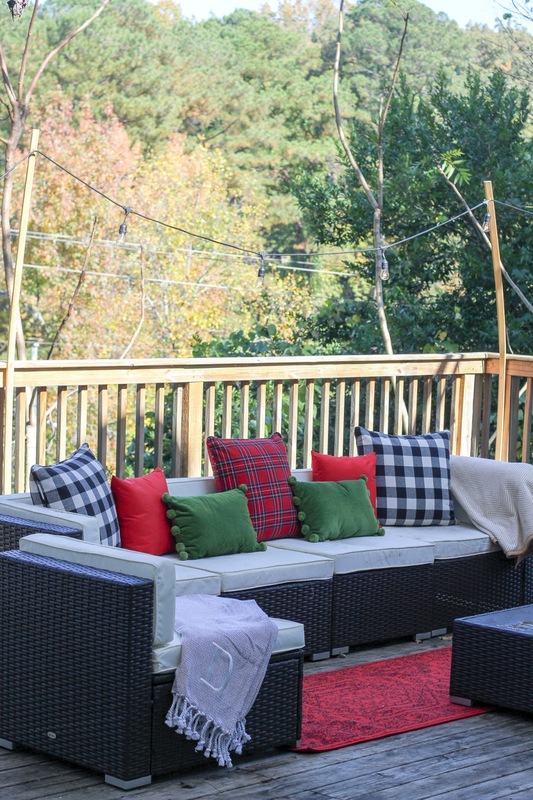 The main area of our deck, where we spend the most time, is piled up on the comfy sectional that we have set up to overlook the sheet we’ve hung to project football games and movies. I can’t remember where we found the sectional, but I’m not positive I’d recommend it since the cushion covers don’t seem as waterproof as they should. Luckily, they can be removed and washed, but that was a bit of a bummer. 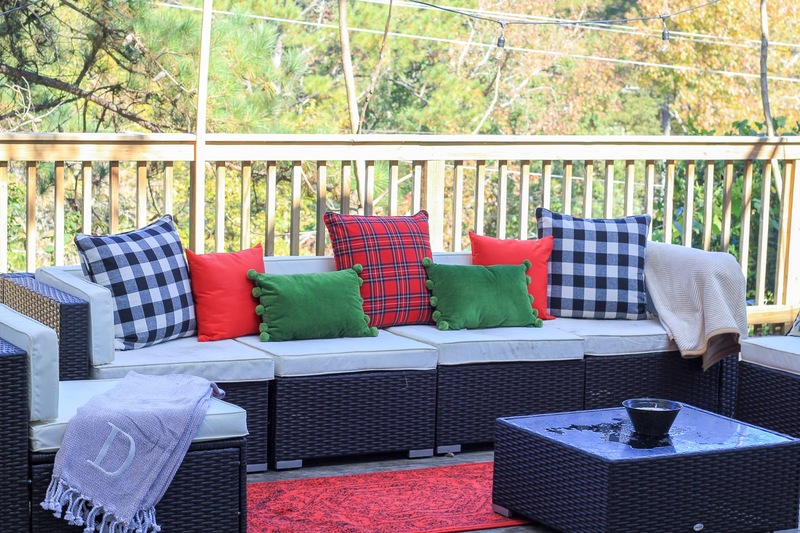 While the provided cushions were perfect when the weather was still hot, we recently added blankets and pillows sent to me by Painted Brick Studio to transform the space to be more inviting and comfortable for the cooler weather. Painted Brick Studio offers home décor accessories to give your space that just right feeling. You can choose from a variety of styles on the site as well as price ties while also answering a short questionnaire to provide insight as the items are curated just for you. I love the way the pillows, blanket, and rug fit together in our space to make it that much more inviting. 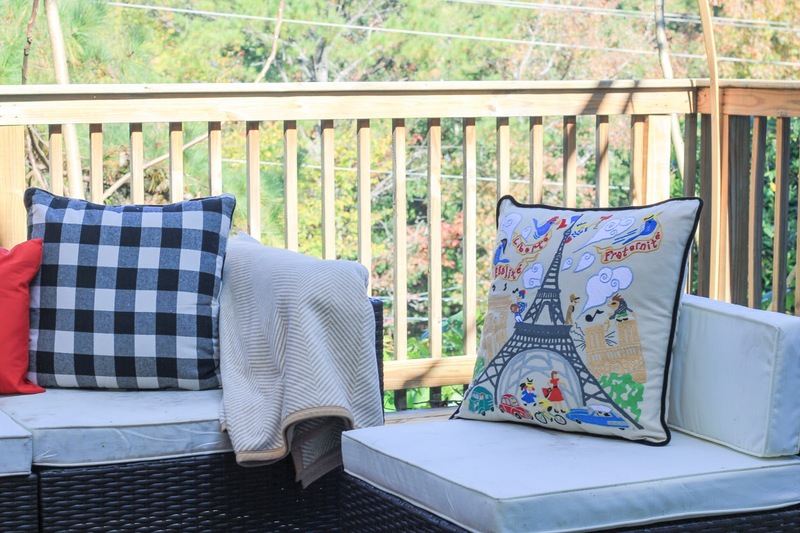 While these items weren’t made for an outdoor space and needed to be brought in after we enjoyed them, I already have a space in mind for them. If you’re interested in trying out Painted Brick’s services, they are so generously giving my readers and followers a 15% off discount with the code prep15. This is especially perfect for any of you looking to finish up a space before friends and family come for the holidays! As for the lights we hung, that was a bit of an adventure. I originally had planned to use metal poles and cement to hang the lights and decided that was more of an undertaking than I was hoping. 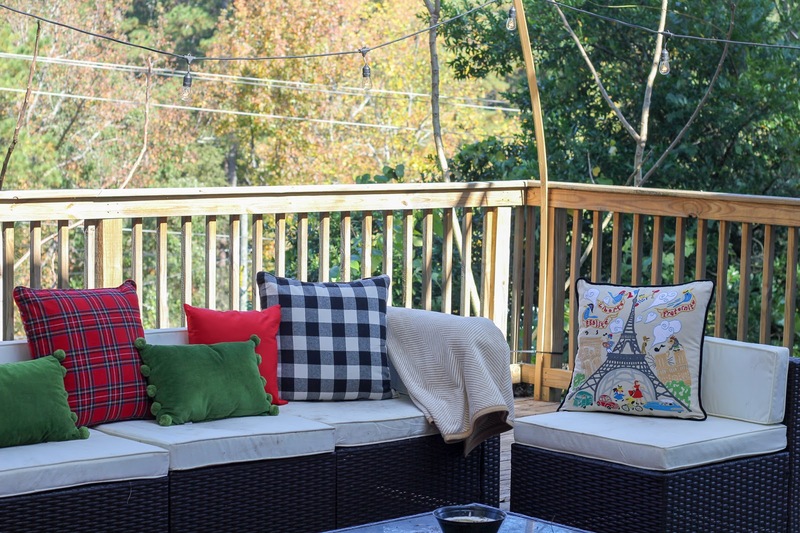 Eventually, I opted to hang them with wooden posts screwed into our deck. They have stayed up well, and for any of you looking to purchase outdoor lights, I’d definitely recommend this outdoor set from Amazon since they are meant to withstand all weather. 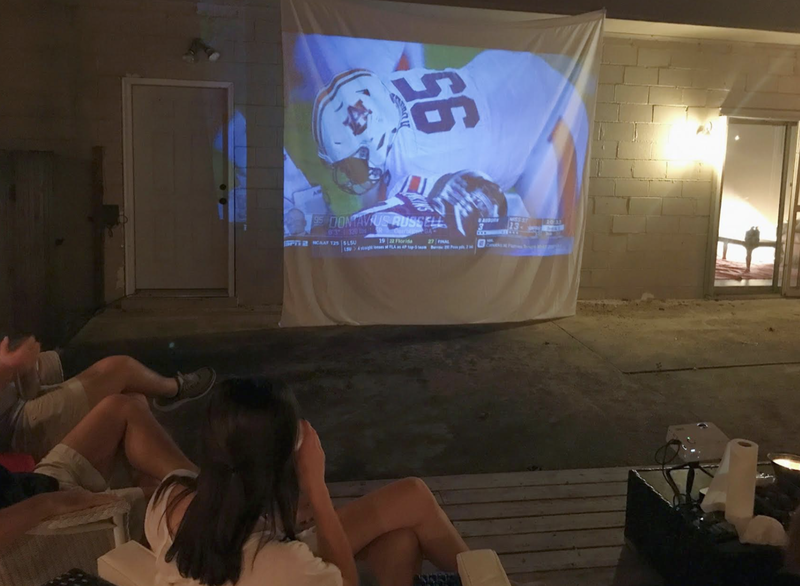 The last and probably most enjoyed area of our deck is the giant sheet that we hung from our houses wall with command hooks to serve as a screen for the mini projector we found on Amazon. While it may seem kind of silly to buy a projector, it has arguably been the best investment we have made for our house so far since it has brought so many people over and helped us form friendships. We got ours from Amazon for about $80 and were shocked by how great the quality is and the fact that it has a speaker built in is a major perk since you don’t have to worry about juggling another cord. We take our apple tv box from our living room and connect it directly to the projector to watch football games and movies. There you have it, one of our must enjoyed spaces in (or should I day outside) our house! 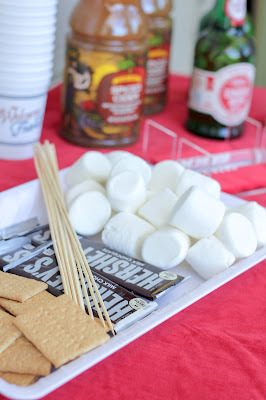 I'd love to hear any ideas you may have for fun ways to use the space during the holiday season.